PEN American Center, the largest branch of the world’s leading literary and human rights organization, announced this week the winners and runners-up of the 2016 PEN Literary Awards, the most comprehensive literary awards program in the country. Among the awards is the PEN/E.O. Wilson Literary Science Writing Award, which celebrates writing that exemplifies literary excellence on the subject of physical and biological sciences. The winner receives a cash award of $10,000 and is honored at the PEN Literary Awards. Using an eclectic combination of narrative, dialogue, scientific explication and reportage, ‘Thunder & Lightning’ unearths the powerful and unexpected ways in which our lives are shaped by rain, wind, cold, fog and heat, and the range of methods by which we’ve attempted to predict and control their vagaries. Cemeteries are washed away by storms. Engineers attempt to manufacture winds in Mecca. The passing of North Korean dictators is said to extract snow from cloudless skies. 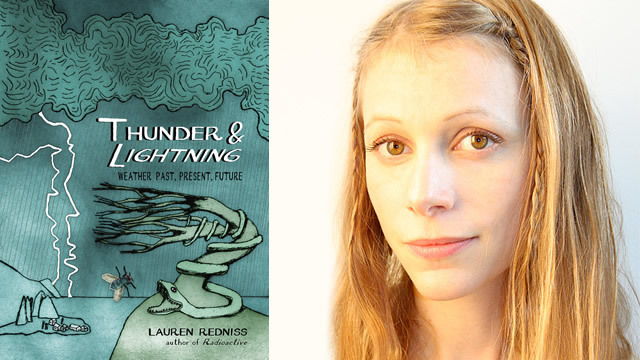 ‘For millennia,’ author Lauren Redniss writes, ‘people have found meaning, and divinity, in weather.’ With whimsical illustrations accompanying its evocative, lyrical writing, Thunder & Lightning underlines the profound, multifaceted impact climate change will have on our species. This is a haunting, utterly original work on an urgent topic. Joshua Foer is the author of the international bestseller Moonwalking with Einstein: The Art and Science of Remembering Everything, which was a finalist for the 2012 Royal Society Winton Prize for Science Books. A 2013 Guggenheim Fellow, Foer’s writing has been published in The New Yorker, National Geographic, Outside, and Esquire. He is also the co-founder of Atlas Obscura. Virginia Hughes is the science editor of BuzzFeed News. Before joining BuzzFeed, Ginny was an independent journalist specializing in genetics, neuroscience, and biotechnology. She was a contributing editor at Popular Science, and her blog, Only Human, was published by National Geographic. Her writing has also appeared in The New York Times, Slate, and twice in The Best American Science and Nature Writing anthologies. She lives in Brooklyn, New York, with her husband and energetic herding dog. Sonia Shah is a science journalist and prize-winning author. Her work has appeared in The New York Times, The Wall Street Journal, Foreign Affairs, and Scientific American and has been featured on RadioLab, Fresh Air, and TED, where her talk, “Three Reasons We Still Haven’t Gotten Rid of Malaria” has been viewed by over 1,000,000 people. Her 2010 book, The Fever, was long-listed for the Royal Society’s Winton Prize. Her new book, Pandemic: Tracking Contagions from Cholera to Ebola and Beyond, is forthcoming in February 2016. • Rain: A Natural and Cultural History (Crown), Cynthia Barnett. Read an excerpt. • The End of Plenty: The Race to Feed a Crowded World (W. W. Norton), Joel K. Bourne Jr. Read an excerpt. • The Boy Who Played with Fusion: Extreme Science, Extreme Parenting, and How to Make a Star (Eamon Dolan/Houghton Mifflin Harcourt), Tom Clynes. Read an excerpt. • Thunder & Lightning: Weather Past, Present, Future (Random House), Lauren Redniss. Read an excerpt. • Island on Fire: The Extraordinary Story of a Forgotten Volcano That Changed the World (Pegasus Books), Alexandra Witze and Jeff Kanipe. Read an excerpt. • The End of Plenty: The Race to Feed a Crowded World (W. W. Norton & Company), Joel K. Bourne Jr. The PEN/E.O. Wilson Literary Science Writing Award was founded by scientist and author Dr. Edward O. Wilson, activist and actor Harrison Ford, and the E.O. Wilson Biodiversity Foundation. The award is also supported by James and Cathy Stone. The inaugural award was conferred in 2011. Examples of published works that exemplify the quality of writing the award is designed to acknowledge include Rachel Carlson’s Silent Spring (1962), Dr. James Watson’s The Double Helix (1969), Lewis Thomas’s The Lives of a Cell (1978), and Douglas Hofstadter’s Godel, Escher, Bach: An Eternal Golden Braid (1979). “PEN Announces Finalists for 2016 Literary Awards.” By John Williams. The New York Times. February 2, 2016.